Categories: Divine Names, Satsang, Spirituality. 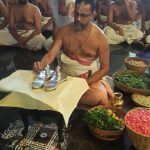 The day of the very first Akhanda Nama at our home dawned on August 15, 2015. I was so elated that I couldn’t sleep the night before! The next morning, after my family was ready, we started chanting the Mahamantra. Suddenly the doorbell rang and my energetic sister zoomed to the door. Our very first satsang devotee joined us. We chanted continuously until Mayaji, from GOD Dallas, arrived with the deities, Sri Premika Varadan and Sri Madhuri Sakhi. 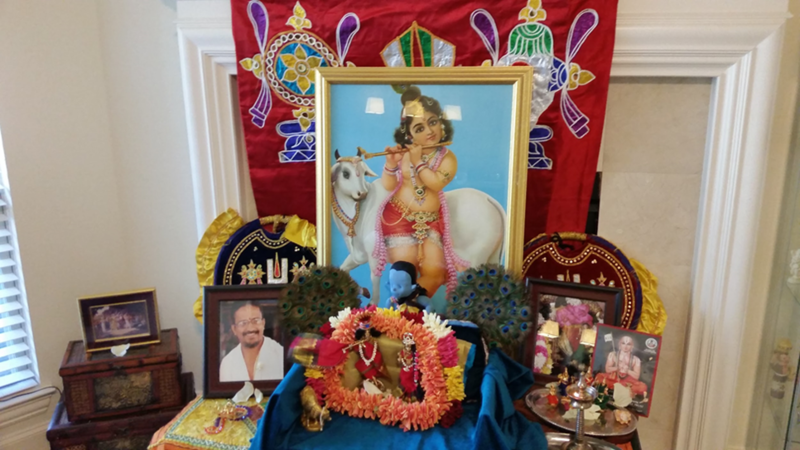 We stepped outside and did arathi to welcome the Lord to our house! The deities were elegantly dressed in maroon with twinkling ornaments. Mayaji let us choose some accessories for the couple. I chose a red turban with a blue jewel for Krishna and a diamond-studded crown for Radha. I made a few garlands for them. We seated them on a seat with some fluffy pillows. We continued to chant some more. Many more devotees followed to come have the Lord’s darshan and chant the powerful Nama. Many flowers were brought and we kept making garlands of vibrantly colored blooms and adorning the deities in the altar along with Sri Guruji. 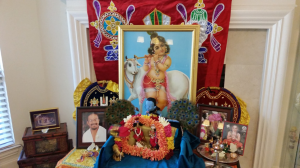 Around 4 pm, after continuous chanting, we had Gopa Kuteeram and had to practice for Janmashtami, as we were going to dance to 2 kirtans composed by Sri Guruji on Lord Krishna. After we practiced the dance, we kids watched a video on Vishnu Puran, that had a depiction of Vishnu’s avatars. Then around 7 pm we were called down from the media room upstairs to sing bhakti kirtans. Every Akhanda Nama we sing Madura Gitam songs composed by Sri Guruji. When we came down, we noted that Thakurji was seated on a swing along with his consort. The couple were adorned with flowers along with our humble Guruji and Ramanuja Acharya. The swing for Krishna was strung full of colored lights. We took turns singing. I sang “Radhai en Thai”. After the singing we sang “Kaliyayum bali kollum” and “Devaki balaya”. We made sure Premika Varada tasted the food first. After arathi, we had a yummy dinner. I knew Premika Varada liked the food because he was smiling at me when I was eating my food! Alas, the beautiful day had come to an end. I felt very sad when the Lord had to leave as I wanted the Divine Couple to stay longer. I was sad but I knew there were many more Akhanda Namas to follow. Since that day, we have gone to all the other Akhanda Namas in town regardless of distance and time to travel. 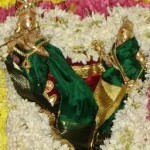 It is a lot of fun to go to other family homes and see the Lord in various beautiful outfits and flower decorations. Akhanda Nama is unique because it takes place in many different homes every time and myself and kids can play hide and seek, and figure out the mystery of each home! I am always waiting for Saturday to come because that’s the day we will have Akhanda Nama, which is full of fun to me! I hope that more and more people come to Akhanda Namas to chant the glories of the Lord, see the amazing deities, and to enjoy the association of other devotees and share their wonderful experiences. For kids like me, I’d like to meet and play with other devotee kids and form lasting friendships based on how Lord Krishna interacted with all his friends. 12 Responses to "When Premika Varadan Came Home"
Very well written! Wish many more to come. Good job. Keep it up. Very nice narration. Glad you are having so much fun. May Krishna be with you. Awesome write up ! Enjoyed reading it! I can feel the pure devotion in your writing. May God bless you Krishna Priya. Very beautifully written. Thoroughly enjoyed reading it. Radhe Radhe. 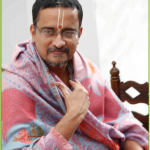 Very well written…May Krishna bless You. Very devotional, pure hearted write-up & you have a sweet name :-). It’s rarity, we come across this kind of spiritual thinking, language & detailed presentation, by a 10 year old in United States. Krishna Priya you have a very promising future whatever you will do in your life. So…Sweet….. as your name…. Krishna Priya! !